Quantum Theory is mostly based on the concept that subatomic particles can have both wave-like and particle-like properties. This phenomenon is known as wave–particle duality. The theory is widely accepted because experiments have shown that electrons can bend around objects and can display wave shapes. Also fascinating is the fact that particles travel in probabilistic waves. Electrons always “are” where we attempt to measure them. Quantum Theory is still incomplete and mind blowing to most of us. However, it has a direct connection to our Rahm household Thanksgiving Day dinner. In Quantum Theory, subatomic particles travel in probabilistic waves. Probabilities are a vital ingredient in all the theories. In our Rahm Thanksgiving Day dinner, probabilities also play an important role. There is a certain probability that my husband, John, will start a minor fire while deep frying the turkey. The probabilistic nature of this minor fire is confirmed by the annual presence of a big fire extinguisher positioned by the deep fryer. John will not fry anything without our big fire extinguisher. I don’t think John understands Quantum Theory. But, he has at least an acquired understanding of grease fires. And, like electrons circling an atom, John will keep everything and everybody at an appropriate circling radius by positioning the fryer in the middle of our driveway. Early Quantum Theory was developed through extensive measurements and experimentation. Likewise, our Thanksgiving Day turkey frying requires quantum-like measurement and preparation. 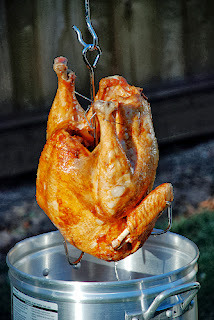 The frozen turkey is placed in the pot and covered with water. Then, the turkey is removed and the waterline is marked on the inside of the pot. This line will indicate the amount of oil that is required to cover the turkey and not spill into the fire, in theory! In both Quantum Theory and turkey frying, how you do the experiment matters. It is important to get the procedures correct. For example, if the turkey is incorrectly inserted into the boiling oil feet first, its narrow neck will act like a funnel atop a boiling pot. Hot boiling oil will geyser and spew upward. And, just like light behaves in Quantum Theory there will be reflection, refraction, diffraction, and interference! Mostly it will be John yelling and running for the fire extinguisher. Modern physicists are now trying to reconcile the well proven Quantum theories and the classical, Einstein-like description of how the universe operates. String theory has emerged as the latest attempt to bridge the gap. Essentially, String Theory hypothesizes that particles wobble around like strings. I believe in String Theory because on numerous occasions I’ve forgotten to remove the string, neck and bagged giblets from inside the turkey. Consequently, all the fixins got deep fried inside the turkey. So, if you want to learn more about life applications of Quantum Theory you can visit me online at www.FB.com/ReliefWithJulie. Lastly, I want to thank Dr. Pearlstein who taught me Quantum Theory at the University of Nebraska. Perhaps we’ll name the turkey in his honor this year!